You login to your WordPress site and want to open a second browser window or tab open so you can view the front end of your site while working in the back-end. This is very handy because while you make changes to your content you can just refresh the other window with out opening your site over top the window you are working in. Here is a really cool tip to open the front end of your site in another browser window or tab directly from your dashboard. The Control key is right below Shift on most keyboards. If you click your site title alone, your site will open over top in the same window or tab. But if you depress the Cmd (Mac) or Ctrl (Windows) key on your keyboard while clicking your mouse on the title of your site it will open in a new window or tab. How to clear your browser cache and refresh the browser. When I am working with a client and make changes to their site I ask them to clear your browser’s cache and refresh the browser so they can see the changes. Refreshing the browser just reloads the page. Look for a circle with an arrow on the end of it. Usually it is up by the address bar, right or left and looks something like these examples. When changing a background or header image you may need to refresh twice and/or clear your browser’s cache. Clearing your browser’s cache removes temporary internet files from your computer. Every time you visit a website your browser stores the pages on your local computer in a temporary file. This enables quick loading of the pages when you revisit a website. But when you are working on your site and go to view your changes and see that nothing has changed – it can be a bit freaky. You say to yourself I know I did that right or I thought I did. First thing to do before you go back and change anything is to clear your browser’s cache. It is good practice anyway and if you have never done it you may find it helps your computer to speed up. Example from FireFox. 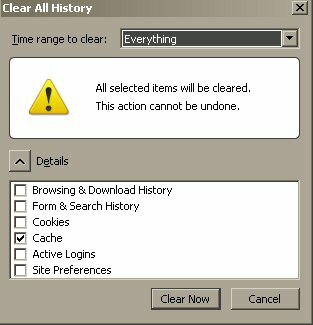 Go to Tools and select “clear recent history”. Clearing your browser’s cache will remove the stored pages from the temporary file on your hard drive. Every browser has a slightly different process to do this. Now clear your browser’s cache and refresh your browser and you can see all your hard work (and mine).